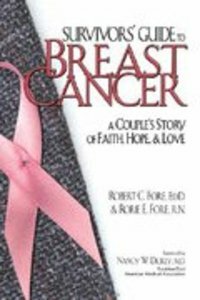 Well established in the medical profession, the authors have co-written a book telling their story of Rorie's breast cancer. While the book recounts the physical battles, it is truly a story of the couple's hope and love and faith that sustained them through their struggle. - Publisher In the spring of 1996, Rorie could no longer ignore the disease that strikes 1 in 8 women. After 25 years of marriage, she and her husband, Robert, both health care professionals, were faced with the diagnosis of breast cancer, which resulted in Rorie's having a double mastectomy and treatment that included chemotherapy, radiation, and breast reconstruction. Together they faced the challenge and relied on their faith in God and their love for each other to survive and share their inspirational story with others in the same circumstance. Candid, open, and honest, their story is a beacon of hope. About "Survivors Guide to Breast Cancer"
In the spring of 1996, Rorie could no longer ignore the disease that strikes 1 in 8 women. After 25 years of marriage, she and her husband, Robert, both health care professionals, were faced with the diagnosis of breast cancer, which resulted in Rorie's having a double mastectomy and treatment that included chemotherapy, radiation, and breast reconstruction. Together they faced the challenge and relied on their faith in God and their love for each other to survive and share their inspirational story with others in the same circumstance. Candid, open, and honest, their story is a beacon of hope.